Imagine feeling gorgeous and beautiful at one moment only to be brought down by, ‘Hey you have dandruff’. One wants to drown in a glassful of water then. The worst thing about dandruff is that it not only is embarrassing but it also has an adverse effect on one’s skin. It is without a doubt the singularly most embarrassing condition and also not easy to check and treat. Though it is not directly related to hygiene keeping scalp clean does help. Specific skin or medical conditions and also using products that are not appropriate can increase the risk. If it is severe, then you must consult a doctor. Dandruff in simplest terms is a scalp condition which makes flakes appear and is mostly accompanied by the itchy scalp. If you have recurring dandruff, then be warned it is your scalps way of letting you know that you are not giving it the hydration it requires and not even keeping it clean. Though the exact cause has not been ascertained but certain studies have linked it to the onset of puberty. Seborrheic Dermatitis: people who have this condition are more likely to have dandruff as they have oily skin. As this condition is related to Malassezia (a fungus that lives on the scalp) once it gets overactive, it makes the scalp irritated and also produce extra oil. The death of these additional cells and their mix up with oil leads to dandruff formation. When you do not brush or comb your hair regularly. Yeast: people with yeast sensitivity are more prone to developing dandruff. Hair products: specific hair products might trigger dandruff, overuse of shampoo is also a culprit. Likewise not shampooing enough could also cause dandruff. Medical conditions: studies have shown that people with HIV are more prone to developing dandruff. Diet: lack of zinc, Vitamin B and certain types of fats in diet make one more susceptible to dandruff. Do not allow the difficult condition hold you back as having dandruff is not just bad for your scalp it is also bad for your self-esteem. 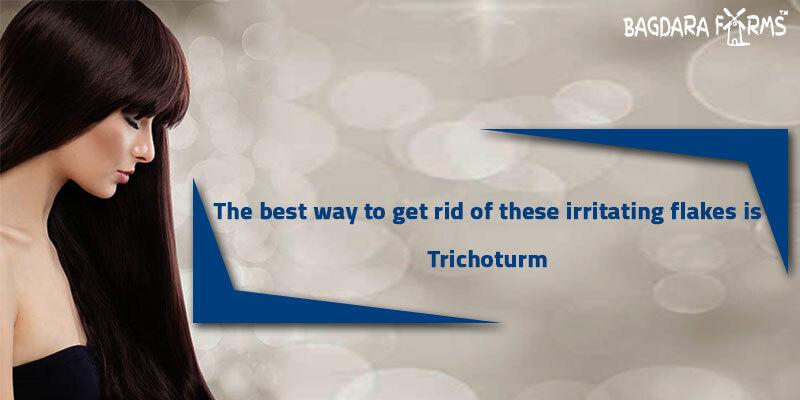 The best way to get rid of these irritating flakes is to get Trichoturm from Bagdara Farms. Trichoturm like all Bagdara products is 100% organic and is curated carefully to help you get rid of this irritating and embarrassing condition. It is enriched with nature’s most powerful anti-inflammatory agent Curcumin, and it is this property which helps in bringing down itching and irritation of the scalp. Curcumin in Trichoturm as a powerful anti-microbial action which helps check the growth of dandruff. The anti-fungal property of Curcumin checks the growth of fungal infections that give rise to severe scalp conditions like Seborrheic Dermatitis. The anti-oxidant property of Curcumin in Trichoturm has an anti-oxidant property which is much more powerful than Vitamin C & Vitamin E which works towards protecting your hair not only from damage but also assists in repairing damaged hair. Curcumin has a dynamic action in stimulating blood circulation throughout the scalp thus reducing the chances of dandruff formation and keeping your scalp hydrated and cleansed. 4-5 tsp of olive oil. Apply this mixture to the scalp and leave it for 15 minutes and wash it off with a mild shampoo. 2 tbsps. Of cold pressed coconut oil or extra virgin olive oil. Let it stay for about 3 hours and then shampoo. You must remember all remedies work only if you make some changes in your lifestyle, the same applies to Trichoturm make the changes and watch the magic take place.